Traditionally, a pecan pie is a pie made of pecans mixed with a filling of eggs, butter, and sugar. Variations on the filling ingredients may include white or brown sugar, sugar syrup, molasses, maple syrup, or honey. Chocolate and bourbon are ingredients often added for variations on the original recipe. Of course, none of these options are low-carb or keto friendly. The pie is an incredibly popular staple at holiday meals in both the United States and throughout the world. This delicious dessert is thought to have originated in the Southern US (we know how to make things ultra delicious down here). Slices of pecan pie are often garnished with whipped topping or vanilla ice cream. DOES THIS PIE HAVE TO BE CRUSTLESS? The short answer is… no. If you want, you can easily create a simple keto pie crust to go along with it. The crust is left out of this recipe for simplicity and carb count. Sure, a keto crust won’t add a lot of carbs, but when counting carbs, they add up quickly. If you are absolutely dying to add a pie crust to this, check out the directions below on how to make a simple crust. To make this crust, preheat oven to 350° F and grease a glass pie plate with butter. In a mixing bowl, mix all of the ingredients together until dough-like. Knead a few times until smooth. Press the dough into the pie plate and bake for 10 minutes. Voila! A simple keto pie crust! WHAT SHOULD I DO IF MY PIE DOESN’T SET PROPERLY IN THE OVEN? In that case, leave it in the oven a little longer. As more of the water content from the ingredients evaporates, it should set more quickly. Something to keep in mind, using different brands of sugar-free maple syrups can affect how this pie behaves both in and out of the oven. 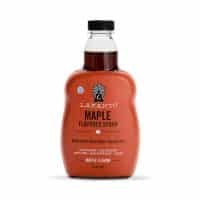 You can find more information about using different brands of maple syrups below. CAN A DIFFERENT SUGAR-FREE SYRUP BE USED? Yes, it can. 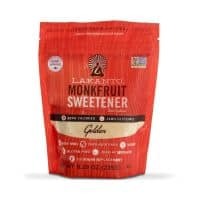 We always recommend using products from Lakanto, as they are the best sweeteners we have ever tested, tried, and used. However, it is not necessary that you use this specific sugar-free syrup for this pecan pie. There are plenty of sugar-free syrup options you can find in grocery stores and supermarkets. A word of caution about these “easier to find” syrups. Make sure you take a look at the sweetener used. The cheaper, widely used sweeteners can be very bad for fluctuating your blood glucose levels. Sweeteners like maltitol and xylitol are often found in sugar-free syrups but are two of the biggest culprits in raising glucose. If you find these sweeteners listed on the back of the label, be wary of using them. As we always remind you, we are all different and of course, react differently to different sweeteners. What works or doesn’t work for one of us can have the opposite effect on the other. Storing pecan pie is incredibly easy. The simplest way to keep it is to cover the top of the pie plate with either plastic wrap or aluminum foil and store in the refrigerator. This pie will keep for several days, chilled without issue. Alternatively, you can slice the pie and store in air-tight containers instead of the pie plate. CAN I MAKE THIS PIE AHEAD OF TIME? If you are planning to bake this pie in advance of a holiday or gathering, it would be best to only do so a day in advance if possible. Of course, the best method is to bake the day you plan to serve it. CAN CHOPPED PECANS BE USED IN PLACE OF WHOLE ONES? Of course, they can! Whatever kind of pecan you have or would like to use with this pie is perfectly fine. Whole pecans are what you see used most often, but other forms of the pecan will taste just as good! Reheating this pie is very easy. 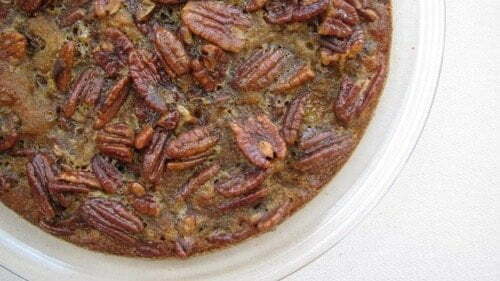 Below are a few ways you can easily reheat this keto pecan pie. The best way to reheat pecan pie is to reheat it in the oven. The goal, of course, is to heat the pie through without starting to cook it again. Pre-heat your oven to 300˚F. Warm your keto pecan pie slice for roughly 8 minutes before removing. If the pie needs more time to warm through, warm in four-minute increments until the desired temperature is achieved. While the microwave is certainly an option, it can often change the taste. Artificial sweeteners, even monk fruit, can skew the flavor when heated quickly in a microwave. Heat your piece of pie for roughly 15 seconds before removing. Continue to heat in 15-second intervals until the desired temperature is reached. Another "most liked" tweaked for those who prefer to enjoy sweets without tons of carbs. This keto pecan pie will be your next favorite dessert! There was a glitch on the page and the recipe wasn’t showing. It’s fixed now! I just calculated the nutrition of this recipe and it has 22.8 grams of carbohydrates… Im assuming in your nutrition facts you put net carbs but in my calculations there are 7 grams of net carbs. How did you get 2 grams of carbs? I re-ran the ingredients through the nutrition analyzer I use and came up with the same. The difference might be how the app or website you’re using handles sugar alcohols, which are listed as carbs, but shouldn’t be calculated into the overall nutritional content.